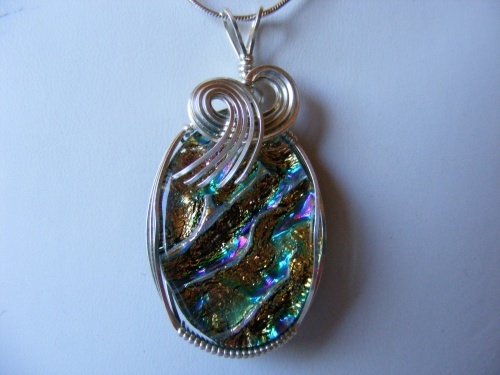 This beautiful piece of multi colored dichroic glass is so striking when looked at, as it shows off elegant colors of golds and blues and greens. So pretty with its sterling silver swirls and so unique that youll be the envy of everyone that sees it. Piece was fused by late glass artist Rhonda Young and is now one of a kind to never be found again. Piece measures 2" from top to bottom and 1" wide. Comes with a sterling silver chain.